We all have an inspirational story to share. I believe that it is our duty to share it with the others so that we can inspire others and help them along on their healing and spiritual journey. My wish is that my story offers you comfort and reassures you that you are not alone in your life’s struggles and challenges and that there are others out there that understand you and that have had similar experiences. In my life I have experienced many challenges. These included living in an orphanage, physical and emotional abuse, many serious illnesses, ongoing weight issues, lost all of my money, I was rejected and abandoned by many of my family and friends in times of difficulties, and attempts at suicide. I am sharing my journey in the hope that it inspires you and gives you the courage to make the changes and shifts needed in your life as I did so you too can find the health, happiness and harmony I eventually found in my life. My life has not been an easy one and it has had its fair share of challenges however there is nothing I would change and I have absolutely no regrets. I will briefly cover some of the experiences in my life that caused my many illnesses and that forced me to embark on my self-care, self-healing and wellness journey. At the age of about two my mother was diagnosed with cancer. My father was unable to look after me and my sister and he placed us in an orphanage. I can still recall some images of that time. My sister was constantly crying and there was nothing that I could do to ease her pain and every day I would wait for hours at the front door for my parents to return to pick us up however they would never come. It was my first memory of feeling lonely and rejected. Not long after we were taken from the orphanage and shipped overseas to live on the island of Psara, Greece with my grandmother, my father’s mother. My mother at this time had lost her battle with cancer. 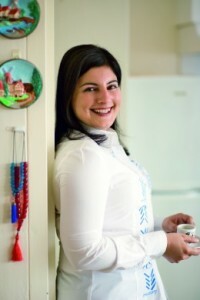 I recall vivid memories in my book “My Greek Family Table”. I recall the “frightening and unfamiliar flight to Athens. My younger sister and I, along with another baby in a bassinet, sat at the back of the plane with an airhostess appointed to take care of us. The baby cried for most of the flight, as did my sister. When we eventually landed in Athens my sister did not want to be separated from the baby. She cried and screamed loudly that it was her baby doll.” “I was initially very confused and sad about leaving Australia. I could not understand why I had to leave and why my mother and father had not come with me. I felt extremely lonely and I had minimal interaction with the other children at school”. “To escape from reality I built my own secret garden. It was an extremely colorful and happy garden and it became my favorite place on the island – somewhere I could escape, dream and be free”. A number of years later I returned to Australia to live with my father and stepmother whom I assumed was my mother and no one told me otherwise. Living with my father and stepmother were the most difficult, painful and challenging years of my life. The years I spent with them were filled with daily physical and mental abuse. My stepmother would use food as a form of punishment when I would not obey her e.g. when I would not steal for her at the grocery store. I would be hit with drumsticks, not fed and then locked up in the downstairs storage room for hours in darkness until I would agree to steal for her. I would agree to steal because my hunger got the better of me however my resistance to stealing continued and so did the cycle of abuse. I was constantly told how I would amount to nothing and how worthless I was. The happiest memory I recall was when I was admitted to hospital for appendicitis. This was the first time I found temporary peace and people that showed care and kindness towards me. When I came out of hospital I prayed to God that I would go back to hospital. God answered my prayers because the first day back at school I was hit by a car and I ended up spending weeks in hospital. The abuse however continued in hospital where my stepmother would hit my right leg that was not broken with a drumstick in the hope that it would break and she would then be able to obtain more compensation for damages caused to me from the driver that had hit me with the company car. A nurse witnessed the abuse and she was removed from the room. My visits were then closely monitored. My abuse led to many physical and emotional scars. A few years later we were taken away from my father and my stepmother by the police because my injuries were extremely serious. We were later adopted by my mother’s sister my aunt, Stavroula’s family. I was not the easiest person to live with and my childhood experiences and pain made it difficult for me to connect with my auntie’s family. They did their best to welcome me into their family and to love me however I did not know how to return that love and often rebelled against it. I started working at the age of 12 in the family food and liquor store after school and on weekends and concentrated on studying to get myself an education. Studying was my solution for dealing with the unresolved deep pain I was in and for my need to feel worthy. My father’s comments on my unworthiness had left a permanent scar in my heart and soul. I decided to move out of my auntie’s place at the age of 18 to begin the next chapter of my life. I thought my brokenness and pain would lessen but instead it worsened. I began to date and I attracted men that were verbally and emotional abusive towards me. I married briefly and I experienced the same abuse. I divorced and felt more broken and that my emotional baggage had increased. There were a few attempts to take my life that failed. I felt deeply disconnected, in constant emotional pain and desperately seeking love from whoever I could. This attracted abusive friendships, business relationships and deeper inner unhappiness. I was broken and I did not know what to do to fix my brokenness. In my twenties I began to develop illnesses in my body. I developed cysts in different parts of my body. The doctors advised immediate surgery because if left unattended they would develop into cancer given my family history of cancer. I removed one on my neck and one from my left breast. I thought that was the end of it until one day on the way to work i fainted and was rushed to hospital. It later turned out that I had blood poisoning and that my left lung had collapsed because cysts had developed that were taking up three quarters of my left lung. A couple of years of regular hospital visits followed along with further surgery. Three quarters of my left lung was removed. Before surgery I prayed with a visiting nun and I said to her that I wished for God to take me so that I may find peace. After surgery whilst I was in intensive care I had an unusual experience. I saw myself standing over my body with tubes coming out of my mouth and body and my auntie crying over me. I was not alarmed and felt a deep and complete sense of peace and serenity for the first time in my life. I thought my wish had been granted and I had passed away. I then heard the words ‘it’s not your time’ and then I was back in my body opening my eyes and asking my auntie for water because I was thirsty. Not long after this surgery cysts were found in my ovaries, which according to doctors were incurable and would also need to be surgically removed. I became frustrated with the medical systems lack of answers as to the cause of my illness, the constant medication, my gain in weight from the medication and steroids, and the recurring surgeries. The doctors failed to acknowledge and understand that there was an emotional or diet related link to my illness. They just prescribed me with more drugs and concluded that I would have to get used to it and this was going to be a part of the rest of my life. I refused to accept this prognosis and decided to search for alternative ways to heal myself. My journey began in Greece in August of 2004. It was a life-changing trip and my first visit back there since leaving Psara. It was on the island on Mykonos that my life changed forever when I visited the small church of Saint Fanourios. It was here that my decision to pursue my passion for food and healing was sealed and my destiny was set on a new course. It was here that my self-healing journey began. 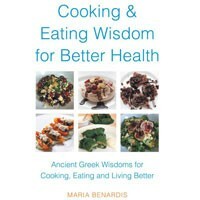 I have a detailed account in my book “My Greek Family Table” and extracts in my book/eBook “Cooking & Eating Wisdom for Better Health”. When I visited the small church of Saint Fanourios I was deeply unhappy with my life and depressed. I entered the church and asked God for help and guidance. I asked what my purpose in life was. It was at this moment after asking that I experienced my epiphany. I saw all that was about to happen in my life flash before me. I realized it was time for me to re-invent my life and in that church I saw a new path set out for me to follow. “I can only describe the experience as Henry Miller did in The Colossus of Maroussi when he wrote: Everything here speaks now, as it did centuries ago, of illumination. Here the light penetrates directly to the soul, opens the door and windows of the heart, makes one naked, exposed, isolated in a metaphysical bliss which makes everything clear without being known”. This is where my calling to move into food and to research ancient Greek texts on food and healing began. Outside the church was an old man, and I greeted him in Greek. “He looked at me intently and then stated that it looked like I had found what I was looking for”. “I was there for what seemed like hours, discussing my future plans and my life with this complete stranger. He was at that moment the most important person in my life. When we parted he gave me a small icon of Saint Fanourios and wished me well”. I began reading Ancient Greek texts and began making small changes in my life. I began with Hippocrates teachings of “let food be thy medicine and medicine thy food” and changed my diet. I went completely organic and ate predominantly fruit, vegetables and other high vibrational foods. My ancient Greek ancestors also adopted practices to “think good thoughts” (Oracle of Delphi) and this was the next step of my healing journey. My ten year journey began of seeking and practicing ancient Greek wisdoms and practices that were used in ancient times to heal the mind, body and spirit. On my quest to heal myself I practiced many ancient Greek wisdoms and philosophies which included intuitive cooking, adopting an intuitive high vibrational food diet and other ancient Greek practices and therapies (an ancient Greek word) that heal the mind, body and spirit. These included chakra therapy, massage therapy, music therapy, light therapy, color therapy, salt therapy, water therapy, sun therapy, dream therapy, prayer therapy, meditation therapy, faith therapy, presence therapy, affirmation therapy, forgiveness therapy, isolation therapy, fasting therapy, gratitude therapy, “agapi” (unconditional love) therapy and the list goes on. I tried everything that was suggested and practiced by my ancient Greek ancestors to heal my body mind and spirit. It was a long solo journey with no family or partner to support me or to fall back on. Many friends turned their back on me during these challenging years. The only support in my life that was left was God (the universe) and I felt that he had my back. I persevered prayed, meditated and had faith that all soon would be well. It was not an easy journey and there were many times when I felt like giving up. I am glad I didn’t. By incorporating these practices and persevering with my healing journey I successfully healed myself from my illnesses and I never required surgery or medication again. My illnesses were the catalyst for transforming my life, work, and health. It was the catalyst for me to return back to love and to learn to love myself and to take care of myself. A conscious decision had been made to leave the years of neglecting and abusing myself behind me and in the past. Through my journey I healed most of my physical and emotional illnesses. I learnt how to love myself and how to take care of myself. I found that I did not need someone in my life to complete me but rather that I was complete and that I was enough. I was loved and guided by a higher power that had my back. My health and wellness maintenance journey continues. I have adopted many of the Ancient Greek wisdoms and practices in my day to day life and they have ensured health, happiness and harmony. I now feel it is my duty and calling to share these ancient Greek wisdoms and practices and to help others. I am also passionate about sharing this information with others so they can also heal and to assure people that it is possible. I have now dedicated my life to been a catalyst in awakening people to the ancient Greek wisdoms and practices that help people live their optimum health, wellness and life and in doing so finding their calling and purpose in life. I decided to document some of my learnings and journey in my book/eBook “Cooking & Eating Wisdom for Better Health”. I also offer intuitive cooking classes and intuitive health and wellness consultations to help people with their healing journey. My wish is that you find all the happiness, love and peace that you deserve. It is your birthright. Maria Benardis has a number of health and wellness webinars coming up about her upcoming events and webinars. The webinars will be on Learn It Live where she will discuss how she healed her incurable illnesses by practicing the ancient Greek wisdoms and practices that heal mind, body and spirit. She also has many other upcoming webinars including cancer free living and eating and food for elevating consciousness and healing. Wow! What an inspiring story Maria! Thank you so much for sharing so honestly. What a difficult beginning you had, and what a remarkable and courageous recovery! Truly inspiring! Your blog made me reflect on my own commitment to healing. Thank you for sharing such a beautifully focused intention! Maria Benardis you are an amazing Women. I just read your blog post re your awakening and healing. You have come so far in life to have come from such tragic beginnings. You are an inspiration to me and although i do not know you i feel profoundly hopeful and inspired to stop being anxious and scared and try out my dream job. I wish you all the best and perhaps one day our paths will cross.